I’ve been lucky enough to work with hundreds of businesses over the years, 1,200 assignments in 22 countries at the last count. And do you know, that out of all those business, the number that were able to articulate to me how their customer segmentation and service offers worked, could be counted on the fingers of one hand! So why is that a big deal? Because from a Supply Chain perspective, understanding your customer’s service needs, and how best to provide that service in a cost effective manner, is absolutely fundamental to ‘good’ Supply Chain. 1. Most companies don’t know the service needs of most of their customers, but they assume they do. You should invariably have a number of different service ‘offers’ to match your customer’s needs. If you don’t you will be ‘getting it wrong’ much of the time. 2. Most companies don’t segment their customer base by these needs. Many businesses miss an opportunity here, by over servicing some customers (at excess cost) and under servicing other customers (at the cost of customer loyalty). Here are two extreme examples, just to illustrate the point. 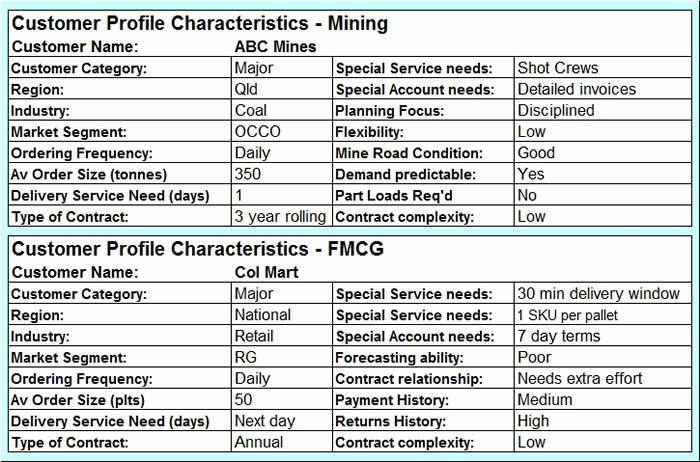 The top table identifies some of the important service characteristics of a mining company, in the eyes of a chemical supplier to that mining company. Many of these characteristics have a significant impact not only on the service that must be offered, but also the cost implications of that service. The bottom table might be more familiar to you, as it relates to a food supplier, who services a large grocery retail chain. Again, there are specific service needs that require additional effort or resources and hence additional costs. 3. Not all customers want the same service! I’ve never worked with a business yet, in over 1,200 hundred assignments across the region, where all customers wanted the same service. And yet many businesses offer just that! You really need to have a process to understand what different customers require in terms of service, so that you can then group those customers together in ‘like’ service groups. Obviously we have to limit the number of service ‘offers’ that any business can support, but grouping customers in this way will help identify what those offers should be. Five or six distinct service offers should cover most customer’s requirements. Delivery on a specific day. Higher than normal minimum order value. Larger minimum orders per product. I.e. must buy at least a case, not ‘eaches’ or single units. All of these boundaries will help reduce Supply Chain costs overall and many customers will be prepared to ‘trade these off’ for a higher service level. 4. 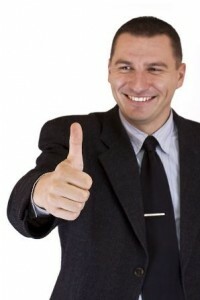 Some customers are happy with what you might perceive as poor service. I’m often reminded of an assignment I managed a few years ago. The client, a large distributor, was very proud that they were able to provide next day service to ALL of their customers. The sad truth was, this caused a real headache for one of their biggest retail customers, who had to go to the expense and effort of storing deliveries off site, because their ‘supplier’ sent orders too quickly! So make sure you understand what good and bad service actually means, in the eyes of your customers. 5. Most companies do not have sufficient Supply Chain cost and performance visibility and hence under perform. I’m astounded at the number of quite senior managers I meet, who have very little idea of their key Supply Chain costs. Why is that? I’m sure they know the cost of their car insurance or the price of a litre of fuel, but for some reason supply chain costs just end up in a large ‘bucket’ of costs the total amount of which, they ‘kind of’ know…. 6. Not all your customers are happy. But they often won’t tell you. It’s a sad fact of life and business, that people are often far quicker to criticise than praise. And this is certainly true in customer service. Figures that are often quoted would seem to indicate that a customer who has received what they perceive to be poor service, will not tell you, but will tell ten colleagues! Find out which customers are losing you money… And make them profitable! This can often be achieved by offering incentives to order less frequently, in larger orders, or to ‘bundle’ products together. All these tactics will help to reduce the ‘cost to serve’ of that customer and return them to being a profitable customer for your business. 8. All companies have non profitable products/services. Just like customers, not all products are profitable. They might need to be in the ‘range’ just to offer an alternative to customers. I.e. We need to offer at least 4 colours, but the black ones make up 90% of the sales! Also look at pack sizes, minimum order sizes, special handling constraints and the like. All of these things can drive up costs, making specific products unprofitable. I hope these thoughts and ideas were of interest, and will help you identify customer service issues and opportunities within your business.